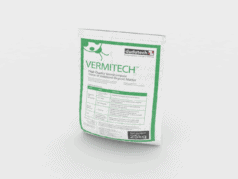 VERMITECH ® is an organic fertilizer produced using worms belonging to the species Eisenia andrei, a well known species used worldwide for vermicomposting. VERMITECH ® is used for soil amendment, as a fertilizer and especially as a component of propagation media. VERMITECH ® is full of beneficial micro-organisms and is essential in replenishing and enhancing biodiversity in both production substrate and soil. VERMITECH ® is a high quality vermicompost made of stabilized organic matter obtained from a process of digestion carried out by the worms belonging to the species Eisenia andrei. VERMITECH ® is to be applied to the soil by incorporation, as a soil amendment and propagation media and by both soil and foliar as a fertilizer. Foliar application will require a solution of water that has been run through vermicompost and the drain collected. Apply VERMITECH ® at between 8-12 metric tonnes per hectare as soil amendment, and 25% of liquid vermicompost as foliar fertilizer or between 350-400 gm/m2 soil applied. And at a ratio of 1:1 as propagation media.